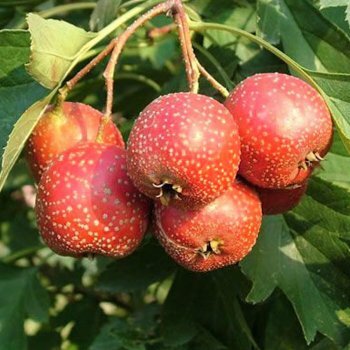 Although known as Big Golden Star, the star feature of this tree is actually its glossy, edible, red haws (not golden at all) which are a similar size to crab apples and slightly pear shaped. Crataegus Pinnatifida var Major, originating from China, is one of the best fruiting Hawthorn trees as, when the fruits are left on the branches, they remain well into the colder months, giving good aesthetic interest to the winter garden. This Chinese Hawthorn is almost thornless, with large, dark-green leaves, turning a deep crimson colour in autumn. Crataegus Pinnatifida var major has the usual Hawthorn-type white flower clusters appearing in May. The tree is a modest size in maturity, reaching a height and spread of 4 x 3 metres in 20 years, making it suitable for small gardens. It prefers sun or partial shade and any well drained soil. Click here to go to all Hawthorn trees. Our pot grown 'Big Golden Star' Hawthorn trees can be planted at any time of the year. Start by removing weeds and grass within a metre of your desired planting hole. Dig a square hole as deep as your root mass and approximately 2x as wide. To help the tree establish more effectively, sprinkle root grow in the hole. You can prune 'Big Golden Star' Chinese Hawthorn trees in summer, after flowering, to help maintain a clear stem. By pruning the lower branches you will raise the crown, creating a more attractive form. If it requires any tidying up, this can be done in autumn. Remove and damaged or crossing branches and ensure there is enough light reaches the inner canopy.